Traveling Morocco’s Sahara Desert for a Morocco vacation is a once in a lifetime magical experience. When considering a Sahara Tour & Camel Trek from Marrakech there are several Sahara Tour options. 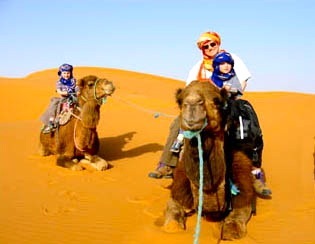 Travel Exploration Morocco is an Ouarzazate Travel Agency based in New York City & Ouarzazate that offers three different Sahara Tour & Camel Trek itineraries from Marrakech. 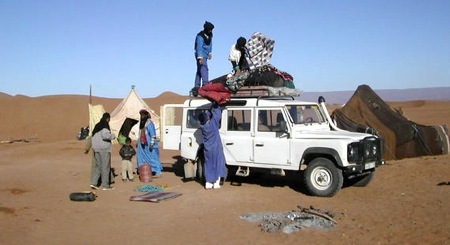 4×4 Travel to Morocco’s Sahara through Travel Exploration Morocco guarantees an authentic Moroccan Sahara journey. Morocco’s Sahara Desert accounts for over 9,000,000 square kilometers (3,500,000 square miles) and stretches across a vast and luminous piece of land. The rolling Dunes in Morocco’s Sahara Desert give way to a unique Sahara experience through their golden waves of sand. Morocco’s Sahara also has a variety of flora and fauna that is indigenous to desert terrain. Each part of the Moroccan Sahara guarantees a completely unique desert experience. The Erg Chebbi Dunes of Merzouga can be reached by beginning your Sahara Tour in Marrakech and then driving through Ouarzazate, to Rissani with a final destination of Merzouga. Merzouga is a small village 35 kilometers southeast of Rissani, 45 kilometers from Erfoud and 25 kilometers from the border of Algeria. Merzouga is famous for the Erg Chebbi dunes and boasts the largest body of water in Morocco. 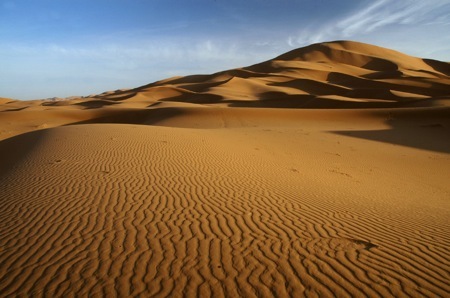 The Erg Chegaga Dunes in M’hamid are another option when planning a Sahara trek from Marrakech. M’hamid is the furthest point of the Moroccan Sahara and is often referred to as the more “authentic Sahara desert.” European and British foreigners have shown more interest in the last century in Sahara treks to M’hamid while American foreigners tend to prefer Merzouga. Visiting the Dunes of Tinfo in Zagora just an hour before M’hamid offers a Sahara trek option within the Saharan Desert town. When planning a camel trek to Zagora this also leaves an opportunity to discover the region’s Draa Valley, the Tamagroute Pottery Cooperative and ancient Zaouia Spiritual Site. Whichever Sahara Desert Tour & Camel Trek from Marrakech you choose, the Moroccan Sahara guarantees a majestic and intimate experience. ►Your Driver will pick you up at your Riad/ Hotel in Marrakech at 9:00am to travel to Morocco’s Sahara in a 4×4. ►Departure from Marrakech to Merzouga Sahara Desert. ►En route from Marrakech to Merzouga, stop to visit the Argan Cooperative where women make Argan Oil, Argan butter and cosmetics. Have a complimentary tasting and sample the products. the Tichka region as you continue your journey to the Sahara Desert. ▶ Arrive in Merzouga, then go by dromedary camel trek for 2 hours at sunset into the Erg Chebbi Dunes to camp overnight in a Berber Biouvac tent at an oasis. Your Tuareg guide will share some of the Sahara Deserts’ secrets. As you glide across humpback on these silent, mystical dunes there will be countless opportunities to photograph the endless rolling dunes. ▶Have dinner by an Oasis in the Erg Chebbi Dunes of Merzouga. Spend the night at a bivouac near the Oasis in the Erg Chebbi Dunes in a bivouac tent under the stars. ►Rise, have tea and bread. Then take a sunrise camel trek from the Erg Chebbi Dunes in the Sahara Desert to Merzouga center. Breakfast in Merzouga Sahara Desert. Sahara Desert. Take the road from Merzouga to Erfoud through Tinerghir and Rissani (old Saharian Desert Town). ►Visit the Rissani souk, which is one of the most famous in the area and surrounded by donkeys, mules, sheep and goats enclosed in corrals. After a tour of Rissani, we are off to Alnif. Alnif is known for its rocks, fossils and minerals found in shops along the roadside Trilobites are the areas main export. ►Continue the road from Merzouga’s Sahara Desert through Rissani, until you reach the Berber Village of Ait Ouzzine nestled in the High Atlas Mountains just 5 kilometers from N’kob. ►Lunch will be served to you in Aït Ouzzine, Morocco by a traditional Berber family. The menu will include a traditional meal of fresh baked bread with spices and a chicken and vegetable tajine and fresh local fruits for desert. Explore the Berber Village. Watch them make bread. Have your feet and hands with henna and see how the traditional and original people of Morocco live. ►Have your hands and feet painted with henna in Ait Ouzzine, Morocco by a Moroccan woman who specializes in the tradition of henna and experience the Berbers making of Berber perfume. ►Tea and Almonds for an afternoon snack. Then continue the road to Ouarzazate. Arrive in Ouarzazate, have dinner at your Riad. ►Spend the night at a beautiful Riad in Ouarzazate that has a terrace and views. ►Rise and have breakfast at your Riad in Ouarzazate. Visit Spices Maria a spice souk nearby and option for a rose or almond oil massage prior to your departure to Marrakech. ►For lunch, relax on a terrace with clear views of Aït Benhaddou and enjoy a traditional Moroccan meal of mfouar (steamed wheat), Takila (a Berber tajine), couscous and fruit. After lunch, browse the village shops then climb back in the comfortable air-conditioned/heated 4×4 and head to the village of Tamadaght. ►After lunch, we will depart Aït Benhaddou and take the road to Marrakech. ▶Stop in the Skoura Palmary to visit the Amirdhil Kasbah. ▶Take the road by piste through the Draa Valley to discover the old road of Moroccan caravans. ►Then continue the road through the Draa Valley to the town of Zagora, the door of the Sahara. Arrive in Zagora and you have the option to spend the night in either a bivouac tent in the Sahara or in a Riad Hotel within a beautiful palmery. ►Rise, have breakfast in your Riad in Zagora, then take the road to visit Tamagroute. ►Visit the village of Tamergroute in the Sahara Desert known for it’s a potter’s cooperative (making forest green, glazed pottery) ksars and kasbahs as well as the prestigious Zaouia Nacri. The Zaouia Nacri is a 17th century Islamic academic center was built by Mohammed Bou Nasri and made Tamergroute the most important settlement in the Draâ Valley. ►Visit the Zaouia’s library where you can see illuminated Korans, animal hides, 12th century works on mathematics, medicine and history. Then take the road to Visit the Sahara Desert’s Dunes of Tinfo and see the old sign where the caravans took the road to Timbuktu. ►Explore the town of Zagora and the Amazrou village. Walk through the desert gardens that lead to the old Jewish kasbah, La Kasbah des Juifs. Visit workshops of the local Muslim Berbers who have continued the Jewish tradition of silver jewelry making, after the exodus of the Jews. ►Take the road by piste to visit the Sahara Desert’s Dunes of Tinfo. 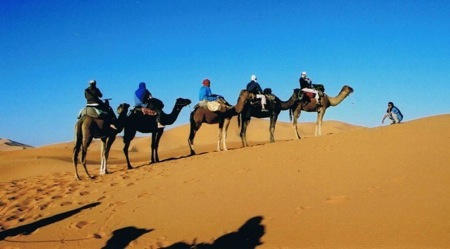 ►Arrive in M’hamid and take a sunset camel trek from the city to the M’hamid Erg Chegaga Dunes. ►Dinner in M’hamid. Spend the night in Erg Chegaga Dunes. ►Rise, have tea and bread. Then take a sunrise camel trek across the Erg Chegaga Dunes to M’hamid center. ► Spend the day exploring M’hamid and enjoying the Sahara’s flora and fauna. ►Take the road by piste to visit the picturesque village of Aït Benhaddou located 32 km from Ouarzazate. Aït Benhaddou is situated in Souss- Massa-Draâ on a hill along the Ouarzazate River. Lawrence of Arabia was filmed here and Orson Welles used it as a location for Sodome and Gomorrah; and for Jesus of Nazareth the whole lower part of the village was rebuilt. In recent years more controlled restoration has been carried out under UNESCO auspices. Aït Benhaddou is one of many locations in this region used for shooting Hollywood films. ►Arrive in Marrakech in the early evening. This ends your Sahara Tour & Camel Trek to M’hamid in Morocco’s Sahara Desert. ►Then continue the road through the Draa Valley to the town of Zagora, the door of the Sahara. Arrive in Zagora and you have the option to spend the night in either a bivouac tent in the Sahara or in a Riad Hotel within a beautiful palmary. ►Take the road by piste to visit the Sahara Desert’s Dunes of Tinfo. Sunset camel trek across the Dunes of Tinfo. ►Dinner at the foot of the Dunes of Tinfo in Zagora, near your bivouac. ►Rise, have breakfast, then take the road to the village of Ait Ouzzine located in the High Atlas Mountains and in Morocco’s heart of the Draa Valley. ►Explore the village of Ait Ouzzine, N’kob Morocco and see how a traditional Berber, Moroccan family lives. Visit their gardens, wheat and henna fields, farming community and meet other members of the Moroccan village. Have an up close Morocco Sahara travel experience.